The sugar maples have turned a beautiful orange and red this week. It’s a great time for the team from our publisher Clarkson Potter to come out for a foraging trip. 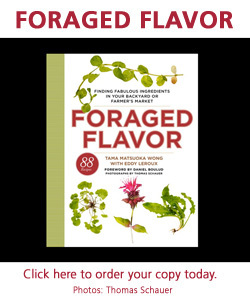 They want to see for themselves our book Foraged Flavor come to life. At first they asked if it would be too late in the year to find wild plants; but here in New Jersey wild greens grow right through a hard frost. And it so very easy to find these wild plants right in the back yard. Although I enjoy a mushroom hunt in the woods, I find it more satisfying to be able to spend less time hunting and more time eating! And we did eat! My daughter cooked up two of the cookbook recipes from our foraged finds: Chickweed Crostini and Smoked Salmon with Cardamine Mousseline and Lemon Sauce…accompanied by glass of prosecco to celebrate. In the photos the “foraging crew” all look so happy. I hope this means they will return again in the spring.